Noncomedogenic is a term used to describe skin care and makeup products that are formulated in such a way that they are not likely to cause pore blockages and breakouts. Noncomedogenic is a fancy word that means not likely to cause comedones (or pore blockages). It's mainly used to describe skin care products and cosmetics. A product labeled noncomedogenic does not contain ingredients that are known to clog the pores. 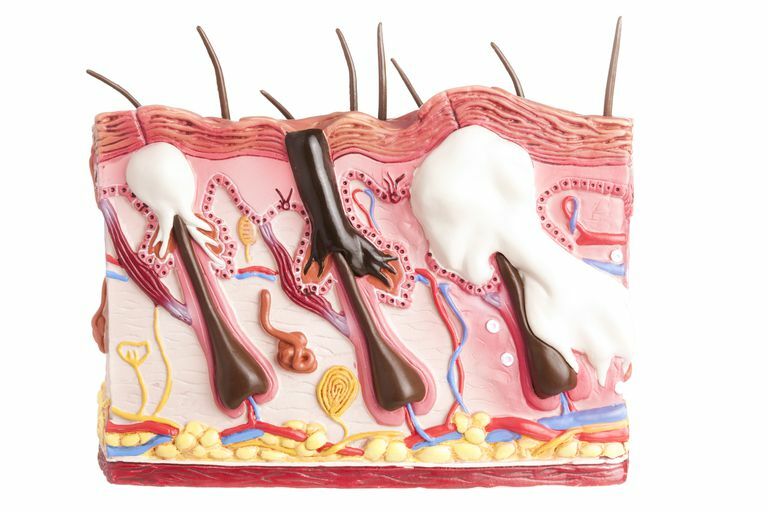 If you have acne, blackheads, or are prone to clogged pores, using noncomedogenic skin care products and cosmetics might help reduce the number of breakouts you get. Which Ingredients Are Noncomedogenic and Which Ingredients Are Not? To determine which ingredients are least likely to cause comedones, as well as the ingredients that will, the rabbit's ear assay is most often used. The substance being tested is applied to a rabbit's ear for a period of time. Then, it's a waiting game to see if comedones develop. The ingredients are rated on a comedogenicity scale from zero to five. A score of zero means no comedones developed, so it won't clog pores. A score of five means there's a high likelihood it will cause comedones. How accurately the rabbit's ear assay transfers to the real world is a matter of some debate, though. A rabbit's ear is not human skin. The ingredients can have a different result on people. But, in general, if the animal doesn't develop comedones or develops very little, it's likely the ingredient won't clog our pores either. If you're breakout-prone, you may want to buy noncomedogenic skin care and cosmetic products just for the added peace of mind. Check the label — it will say noncomedogenic (or non-acnegenic) right on the product. The feel of a product isn't a good indication of whether it is noncomedogenic or not. There are some very emollient, greasy-feeling products that don't contain comedogenic ingredients, and very light products that do. If you're an avid label reader, you might think it's interesting to check the ingredients in your products on a comedogenicity scale. Any ingredient with a score of 2 or less is considered noncomedogenic. Don't drive yourself too crazy, though. Even ingredients with a higher number can be OK, depending on the formulation and how much is actually in the finished product. Are Noncomedogenic Products Guaranteed Not to Clog Pores? Just because a product is labeled noncomedogenic does not mean it won't cause comedones — it just means it's less likely. Everyone's skin is different and reacts differently to every product. Even noncomedogenic products can clog pores in certain people. So, if you're noticing lots more blackheads, whiteheads, and bumpiness after using a certain product, even if it is labeled noncomedogenic, you might want to stop using it and see if the breakouts improve. Also, remember that simply because a product is not labeled noncomedogenic doesn't automatically mean that it will clog your pores. If you've been using a product for years and you love the way it works for your skin, there is no reason to ditch it if it doesn't carry the noncomedogenic label. Will Using Noncomedogenic Skin Care Products Clear Acne? Noncomedogenic has become a big buzzword in the skin care industry. But, really, there is nothing magical about those products. Using noncomedogenic products alone won't clear up a case of acne. For that, you'll need a proven acne treatment, whether over-the-counter acne products or stronger prescription acne medications. If you need help getting your acne under control, a visit to the dermatologist is always in order.